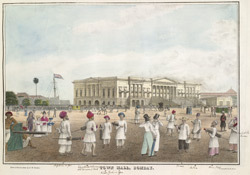 bl.uk > Online Gallery Home	> Online exhibitions	> Asia, Pacific and Africa Collections	> Town Hall, Bombay. Plate three from J M Gonsalves' 'Views at Bombay'. Designed by Colonel Cowper of the Bombay Engineers, the town hall was intended to house a library and museum as well as the civic offices. Money raised by the Literary Society of Bombay proved insufficient and the government was persuaded to bear the costs of construction, a process which took ten years. Completed in 1833, the total costs came to about £500,000, far in excess of the initial estimates. A double row of Doric columns shipped from England were to be used to front the building, however they were too large and were used in the nearby Byculla Church instead.